The Amatis Piano Trio was founded in Amsterdam (The Netherlands) in 2014 by German violinist Lea Hausmann, British cellist Samuel Shepherd, and Dutch/Chinese pianist Mengjie Han. After winning the 2015 International Parkhouse Award in Wigmore Hall, the trio went on to win several international prizes and competitions. Most recently, they were awarded 2nd prize at the International Joseph Joachim Competition in Weimar, Germany and also named Dutch Classical Talent 2015/2016. And in September of 2016, the trio was selected as BBC New Generation Artists. Last season’s highlights include performances at Wigmore Hall and the Concertgebouw in Amsterdam, as well as concert tours throughout Europe and trips to Hong Kong and Indonesia. 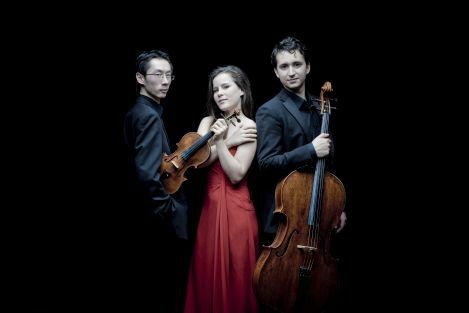 The Amatis Piano Trio is a participant in the European Chamber Music Academy and has worked with Hatto Beyerle, Trio Jean Paul, Lukas Hagen, Fabio Bidini, Ilya Grubert, Anner Bylsma, Christian Schuster, Ib Hausmann, Imre Rohmann, and Menahem Pressler. The ensemble also pursues regular studies with Wolfgang Redik and Rainer Schmidt at the Mozarteum University in Salzburg.